Hello Friends, How was your week? Its FriYAY and I am back for another hop … it’s been a busy but, super fun month. Welcome to the Studio Katia Blog Hop to celebrate the December release. Flowers!! Yes please! I will never get tired of coloring beautiful flowers especially these “Merry Poinsettia“. To start at the beginning of the hop go to the Studio Katia blog. If you are coming from Svitlana Shayevich blog you are in the right place. Shaker cards are fun to make especially when you mix in some crystals. I love that shakers are interactive & fun for the recipient. The card on the right … underneath the shaker mix is the stamped sentiment. After creating my stripes with a ruler I used some copic blending solution to add texture with a rag. I love the “Dotted Patterns Scallop” on the card and circle. Check out this die set so versatile. The sentiment was stamped in the background for a little extra surprise when you pull the card out of a envelope. Addling random sparkle accents with these markers for a little glimmer and shine. Using this large grid pad really helped me line up my ruler. 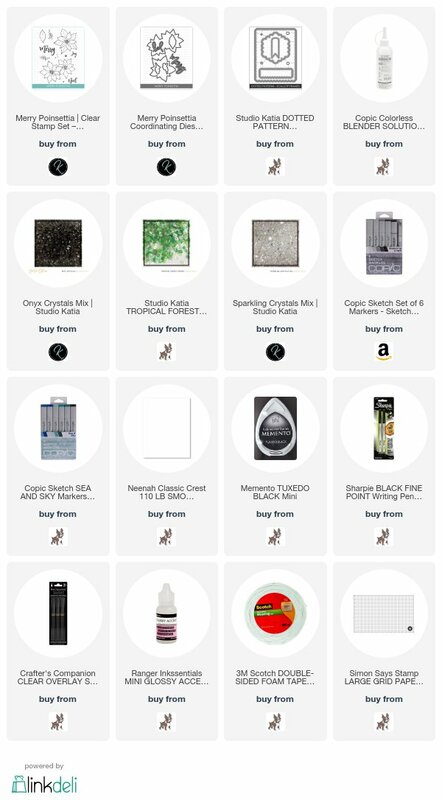 CARD SUPPLIES & links: Depending on the product affiliate links might be used. SRM’s First Blog Hop and some PRIZES!! Amazing thanks for sharing the video! I loved the plaid bgs, thanks for sharing the video:) beautifully coloured flowers ! Both the cards are wonderful. When I grow up I want to color just like you. Ugh I am already older than you. Beautiful cards. Such stunning cards, Kathy! You can’t go wrong with Poinsettias at Christmas and I just adore the way you have coloured them! What a cool idea! Your cards are gorgeous, I love them. Your shaker cards are so much fun. Thanks for sharing. Festive and fun shakers. Brilliant DIY plaid technique. Gorgeous plaid backgrounds! Thanks for the wonderful video! Beautiful poinsettias and pretty backgrounds! Love these beautiful cards! Lovely cards and great tips! So sorry I don’t send pics because haven’t managed to figure that out. Oh my!!! Your shakers are absolutely stunning!!! Plaid and poinsettias!! Too awesome! Lovely shaker card and plaid! so happy to see a truly approachable way to do a plaid with no equipment and a ruler (for the straight-line challenged)..Of course the flowers turn it into a gorgeous card but the plaid technique rounded it all out. WOW! gorgeous plaid background! Beautiful cards! Such gorgeous backgrounds Kathy! Plaid is my all time fave for backgrounds and I love how easy these are to do! Fabulous cards! Love the backgrounds! WOW You make it look so easy. Love your coloring Kathy. Kathy, you make this so easy but I think it is a great design and technique. Thanks as always! Kathy Merry Poinsettias is really pretty. Your coloring gives them such depth. Nicely done. Merry Christmas. Beautiful cards. Love them bth! IS there anything you can’t do? I LOVE that cool background you created. You totally rock my world!! So cool Kathy! You make this plaid business look so quick and easy–I think what it takes is CONFIDENCE in our abilities and to not be over critical of ourselves. I get asked this often, as I have to trust what my hands feel when I work with my clients. It’s all about confidence–and we are all artists! I did send you a photo–thanks for sharing these marvelous floral stamps with us! Very nice video! It’s amazing how easy coloring your own plaid backgrounds can be. Thanks for your time and have a Merry Christmas! Gorgeous plaid backgrounds, love the shaker cards, Thanks for the video! Kathy, absolutely thrilled to see you as part of Studio Katia’s hop! Swooning over your lovely plaid backgrounds; the perfect canvases to showcase the pretty poinsettia and sparkly crystals! So creative! Kathy this is gorgeous and am in love with the new sparkling crystals!!! This is so fabulous and really adds a LUX to the card!! Love your plaid too! How simple to make that plaid paper and how stunning is the result! Thanks for this great inspiration! So lovely, Kathy! Now I’m inspired to create my own plaid backgrounds! I’m going to try it with watercolor markers on Bristol. I think it will work. Hope your Christmas is wrapped in love, dear Kathy! Thanks for sharing your technique for making plaid backgrounds. I like the idea of making my own backgrounds as you can use the colors you like and doing the plaid like that is perfect. I will give it a try! Pretty flowers and I like the plaid background. Love how you created your own plaid background! I love plaid and your cards are stunning. Great video. Your cards are so wonderful. I loved your plaid backgrounds. You make it look so simple to create them. Thanks for sharing your time and talent with us! Wow! Beautiful cards. I. Love watching your videos. Merry Christmas ,this was such a quick,easy background.I love to learn your different process.Beautiful indeed. That is such a great idea! Thanks for the inspiration! great way to create plaid backgrounds …. Absolutely stunning. Im in love!love love love! Great job. Ur soooo talented! Beautiful shaker cards. The plaid technique is terrific…thank so much for sharing. Cheers. Gorgeous florals. Thanks for sharing the technique video. These are beautiful! Love the coloring on the flowers! These cards are lovely Kathy. You really teach me to keep going in my coloring; if I don’t like it, it probably means I’m not done yet. You just keep going and finding ways of adding so much interest and dimension, and I very much appreciate your example. The shaker is a great way of breaking up the plaid so it doesn’t swallow the florals, plus who doesn’t love getting a shaker card? Thank you for sharing you creativity and artistry with us. The flowers and plaids really complement each other. Good job! love these! thanks for the video! Very pretty shaker cards with the lovely flowers!! !